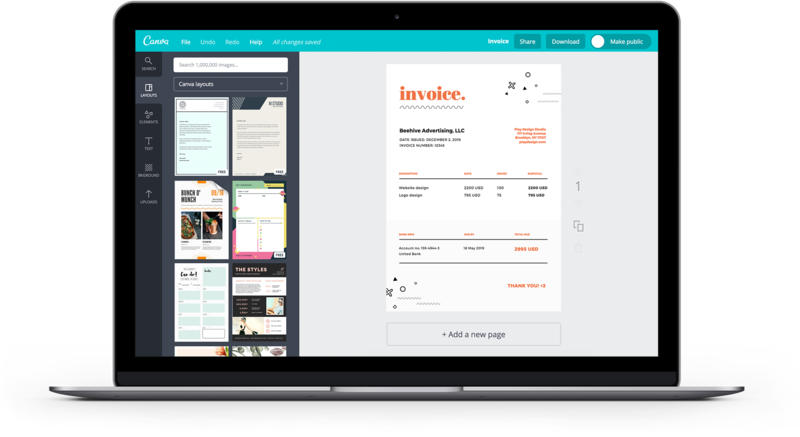 Canva’s free invoice maker allows you to create professional-looking invoices for your clients within minutes. Keep your branding consistent by adding your own logo, brand colors, and fonts to hundreds of flexible invoice templates in just a few clicks. Your brand identity is about so much more than a social media post. It’s about consistent quality and service to your customer. With Canva’s free invoice maker, you can add your personal touch to hundreds of designer-made invoice templates, and turn what was once a boring document into a consistent brand experience for the client. Choose from hundreds of customizable templates or start your design from scratch. Personalize your information in the template. Instantly upload any logos or illustrations you need. Once you’ve designed an invoice that you’re happy with, Canva’s free invoice maker allows you to save your design and copy it with one click. From there, you can easily create invoices for multiple clients without needing to start your invoice process from scratch. Simply update the information, save and send. With Canva’s free invoice maker, you can easily upload your own logo and images. Our templates are completely flexible, which means you can customize colors, shapes, and fonts within the template. With thousands of colors and fonts, and millions of high-quality images and illustrations, you’ll never run out of options. Once you’re happy with your invoice, you can email it straight to your clients. Just click on the share button to let them view the design. Otherwise, you can choose to download your design as a high-resolution PDF or image file for printing. Need to make some changes? No worries! You can access all of your designs on any web browser or even on your mobile devices. Just download our iOS and Android apps for free from the App Store or Google Play. How much does it cost to create an invoice in Canva? Signing up for Canva is completely free! And most of Canva’s pre-designed templates and images are free as well. You can also access Canva’s premium templates, images or illustrations and purchase them at an extremely affordable price. Is there a limit to how many designs I can make? There is no limit to how many designs you can make on Canva. Whether it’s an Instagram Stories template or a Facebook Banner, you can design anything, on any device and download it for free. Can I share and collaborate on my invoices? Sharing your invoice on Canva is easy. To share or collaborate with a colleague, simply tap the Share button in the editor. From there you will be given an option to share by adding their email address or providing them with a shareable link.